Take a look at these fantastic gifts for 5 year old girls. These amazing gifts are fit for all your little princesses, queens, mermaids and not forgetting those unicorn fanatics, of course. All their fairytale dreams will come true with these enchanting toys, dress-up sets and crafting kits. Parents will love just how quick and easy it is to assemble the Windmill Farm Playhouse – it folds out in just seconds! This playhouse is great for saving space too, as, after playtime, you can just fold it up and put it away. The Windmill also spins and comes with 3 piggies and a hen. 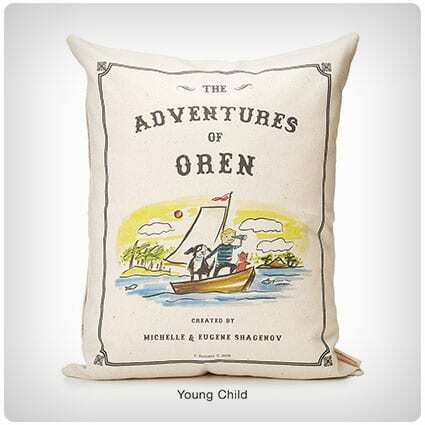 Their imaginations will definitely go crazy with their very own Personalized Adventure Storybook Pillow. A beautiful gift for 5 year old girls, they can snuggle down with the pillow and have amazing dreams inspired by a story all about them. ‘Authored’ by Mom and Dad, family members can even leave a rave ‘review’, too. Created by fellow dad Luis Albarran is the Epic Castle Playhouse – he started off with the notion that no matter what fancy toy you get your kids, they always prefer to play with the box it came in, and so his cardboard playhouses were born. The Epic Castle includes 3 adorable dragons and princess-saving gear. Swim deep into a sea of fantasy with this mermaid duvet and pillowcase set. Any little girl that’s obsessed with mermaids will go nuts for this, and it’s sure to finish off any sea life or girly themed bedroom perfectly. This gorgeous bedding also has a printed tiara sure to make your darling feel special. You don’t have to wait until dressing-up time to play princess – with this lovely royal duvet & pillowcase set, you can now frolic around in a gorgeous gown and glitzy tiara all night long. Let dreams of humongous castles guarded by dragons, and crazy fun royal adventures commence! There’s no better way to cool down in the summer than playing as your ‘lolly’ local ice-cream woman in this fantastic Ice-cream Truck Playhouse. This playhouse is great for popsicle-licking fun all year round, though, even when you’re missing that classic jingle from your neighborhood ice-cream truck. No unicorn fan could go without this ‘horsome’ clock – with this, they will be ASKING to learn to tell the time! The pretty pastel colors are sure to match any young girls’ bedroom, no matter how it’s decorated. Kaleidoscopes are something you find at all little toy stores, but have you ever seen a make your own kit? Neither have we, but we sure know your little girls will love it. This crafty activity will have them occupied and happy for a long while, let alone the fun of playing with it afterwards. Mirror mirror on the wall who’s the ‘fairyest’ of them all?’ It’s definitely going to be your recipient with this. This Fairy Kit is any 5 year olds’ dream come true, it really is the ultimate gift for anyone obsessed with all things fairy. They can make everything from cute tiny beds to fairy-dust necklaces. The My First Magic Set from Ideal will have your mini superstars performing wow-worthy tricks in no time. The kit comes with all the props and instructions they will need to learn 25 tricks, while learning extra codes to unlock awesome online videos from the professional magician himself Ryan Oakes. Whether you have an upcoming family trip to the seaside or the pool, she can’t go without this super adorable one piece mermaid swimsuit – isn’t it just the cutest thing you’ve ever seen, especially with that adorable matching bow? She will feel just like her favorite Disney mermaid with this. This neat Barbie Dreamtopia Fairytale Dress Up Doll goes from enchanting princess to majestic mermaid in just a couple of minutes. This amazing Barbie gift for 5 year old girls has over 18 looks to mess around and play with; will your favorite style be with her amazing mermaid tail or those beautiful fairy wings? Your precious mini-me is going to adore taking her new FancyPal Princess Plush Kitten with her in its uber cute pet carrier everywhere she goes. These 8-inch Aurora World plushies are incredibly soft, and this darling kitten even has her very own crown, matching with the design on her carrier. Explore Happyville on your favorite Shopkins pony with this lovely Happy Places Happy Stables Playset. This set comes with an exclusive Petkins pony, Ponicakes, who’s definitely a must-have for any Shopkins collection, not forgetting her fashionable rider, Jessicakes, who she enjoys winning competitions with and gaining those all-important ribbons. With such a ‘flippin’ fantastic mermaid tail, no little girl should have to go without this Barbie Dreamtopia Rainbow Lights Mermaid Doll. You have to agree that all magnificent mermaid lovers are sure to appreciate this delightful doll, plus, with just a press of her magic necklace, she lights up – how cool is that? With easy-to-follow step-by-step picture instructions, she’s sure to enjoy making her very own magical fairy doll with this creative kit (don’t worry, it requires no needles or pins). She can give her fairy a funky pink hairdo, decorate her wings, build a skirt out of pretty flower petals, and even name it with the certificate. From the popular brand Playmobil comes this wonderful Fairy Garden Playbox – if the fairies don’t sell this to you, then the majestic unicorn will! Just imagine your princess’ face light up when she sees it! The set also comes with 2 cute fairies, leaf chair, magic wands and more. Of course, this list can’t possibly go without the ever-so-lovable furry Hatchimals. Children adore the surprise they get, as no one ever knows who’s going to hatch from the egg! You can even interact with it before it comes out of the egg; tap and they’ll tap back, and you can also hear their heartbeat. Grow your own enchanted fairy garden with this amazing kit. It comes with everything you need: tools, soil, and seeds, as well as adorable garden decorations including a scenic bridge across the stream there is a sweet little squirrel and the charming Calla the Fairy, who simply can’t wait to meet and play with you. Does your little one love to play dress-up? If so, give her the ultimate gift of her dreams with this Disney Princess Dress Up Trunk. This amazing Amazon-exclusive will have her squealing with glee, as it comes with her favorite princesses’ gowns and outfits, as well as accessories, which arrive in a beautiful princess trunk. Is her 5th birthday party going to be unicorn themed? 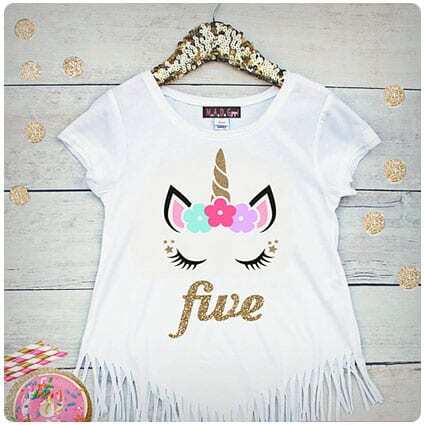 There’s no need for a fancy-dress costume, dress her up in this dazzling 5th birthday unicorn shirt and she’s sure to feel like a special star, plus dancing and twirling around with the fabulous fringe trim is going to be tons of fun. This wonderful gift for 5 year old girls from PlayMonster is definitely going to bring out their amazing imaginative and creative side. Little nature lovers simply start by placing the soil into the Tree Hollow, planting the seeds, and then ensuring they give them water and lots of sun exposure, to make the flowers grow. We’re sure you’ve seen those viral slime videos going about, and no doubt your daughter has caught a drift of the viral sensation too, and has been begging you to make some for her! Getting your slime recipe just right can be pretty difficult, though, so check out this awesome fluffy ocean blue slime, instead. Own up, how many times have you been occupied for just a second, and gone to find her rooting through your make-up bag and attacking your expensive lipstick and eyeshadows? Fret not, moms, because now she can have her very own with this GENIUS kids makeup and cosmetic bag gift set – phew. From Oliver & Olivia on Etsy comes this ultra-awesome Personalized Unicorn Pillow. This is not your usual for-show cushion, though, as this nifty thing changes color with just a swipe of your hand into a fabulous rose-gold centerpiece, then run your hand over it again to transform it back to its magical unicorn state. Well, there’s nothing more magical than magic tricks, and now with this Melissa & Doug Dress-up Set, she can pretend to be a real magician. She’ll soon be gathering everyone into the living room so the whole family can watch her perform her amazing tricks, not forgetting the old classic: rabbit in a hat. She’s sure to have a bloomin’ good time with this Sunny Patch Pretty Petals Flower Sprinkler from Melissa & Doug. Parents simply attach this to a garden hose for instant summertime fun in the garden – there’s really no better way to cool off in this heat than running around and getting soaked! This uber cute ‘mermaid squad’ mint fringe dress from SOUTHofURBAN on Etsy is just SO chic, don’t you agree? Any little girl could completely rock this; pair it with a stylish pair of sandals, denim jacket, and some cool sunglasses for a ‘mermazing’ summer outfit. If she’s a fan of mermaids, then she’s for sure seen The Little Mermaid countless times, so her fins are going to go ‘flippin’ crazy when she sees this totally fab LEGO Ariel and The Magic Spell Building Kit. As well as Flounder, it also comes with the formidable Ursula, so beware. Are you really a parent of a girl if your house isn’t covered in glitter? Probably not, which is why you may as well go all out, as she NEEDS this glitz-tastic Limited Edition L.O.L Surprise! Glitter Series Ball. Inside, she will find 7 new dolls, 5 glitterific outfits, stickers, accessories and more. Your darling little princess can’t possibly go without these ultra-royal dress-up tiaras, from Melissa & Doug’s Role Play Collection. The pack comes with 4 adorable tiaras, so there’s plenty to go around when she has her friends over – why not set up a fun, royal tea party for them? This sweet baby unicorn Fingerling will make the perfect gift for 5 year old girls. This unique toy will become a firm favorite from their toy box, for sure. Fingerlings fit onto a child’s finger, so they can interact and play with their new friends wherever they go (great for occupying them during journeys!). Looking for a way to spruce up her bedroom/playroom? This super stunning teepee is going to do just that. This charming little hideaway will make the perfect little get-away space for some much-needed quiet time, like reading, napping or playing with dolls. It also has a window so parents can easily peek in. She’s probably been begging for her very own pet unicorn ever since she could talk, and while for now the real deal are “out of stock”, these adorable Aurora Unicorn FancyPals certainly aren’t, so this year you can finally make her dreams come true. This fluffy unicorn also comes with a stylish pet carrier, too. Looking for a cheap, quirky item to help bulk out those gift bags? These funky Pineapple Squishies are a perfect idea, and they’re sure to please any young child. Squishies are known for their calming properties, so they’re great for quiet time or keeping kids happy during car rides and plane journeys. If you’re looking for a unique gift for the little monkey that drives you bananas, this bedroom set is a ‘bear’ necessity! This Banana Duvet & Pillowcase Set will give your little primate bunches of wild dreams all about crazy adventures in the jungle with their new hairy orangutan pillow friend. This Under the Sea water globes kit comes with everything your child needs to design and create 3 amazing seascapes. They start with clay (to hold everything in place) push in the cute sea creatures (mermaid, crab, and seahorse), and they can even add sachets of colored glitter for that extra enchanting touch. Before you open this special Hatchimals Secret Scene Colleggtible, you can take a sneak peek through the hole and hold it up to the light to find out who you’re going to get – will it be Sunshine Sparkle, Bubblegum Bloom, or Lala Lavender? Whoever it is, you’re bound to have lots of fun playing together. There’s plenty of jolly, musical mayhem to be had with mucial pat bells. These make a great instrument for little ones, as to play them, you simply pat the button. They’re also color coded to match the music cards, so playing your favorites, such as Twinkle Twinkle Little Star, is as easy as ding-ding-ding. There’s nothing more magical than nature, especially the fascinating process of ‘caterpillar to butterfly’, which children can now watch with awe and enjoy up close thanks to this wonderful Insect Lore Butterfly Growing Kit. Start off with a tub of baby caterpillars, watch them form cocoons, and then finally turn into beautiful butterflies! Your girlies will go nuts for Kiki, a special Fingerlings Glitter Monkey. This interactive monkey responds to her new playmate’s movements, touch, and kisses. Cuddle Kiki, stroke her fur, or hold her upside down to hear babbles of delight, or blow her kisses and she will even blow them back. From Nature Gift Store comes this amazing Live Butterfly Kit. This exciting kit will make a great gift for 5 year old girls, especially those who are obsessed with nature/wildlife, though let’s face it, most girls love butterflies – they’re just so eye-catching. When fully grown, families can release the butterflies into the wild together. Is your precious princess’ room unicorn themed? Then this amazing Personalized Unicorn Wall Art Tapestry will make the ultimate finishing touch, especially if you’re in a rental and can’t quite decorate how you would like. Having her name printed on this wonderful art piece will have her feeling ultra special and unique. Treat your little darling to this delightful Personalized Unicorn Shirt from the LittleBlessingCo store on Etsy. Printed on the ultra soft, white shirt is a glittery gold unicorn, surrounded with a pretty rose reef, finished off with your daughter’s name in a gorgeous girly font (also in gold glitter). Been hunting high and low for the perfect party outfit for your birthday girl? Look no further, as this Personalized Birthday Tank Top is the one! The design, which can include her name and age, can be printed on a white or black top, so no matter her style it’s sure to suit her. No princess is truly complete without her very own magic wand, and now your royal daughter can design her own with this unique Melissa & Doug Kit. Included is everything she will need to create, paint and craft her wand – it even comes with glitter glue to finish it off with gorgeous magic sparkles! Poor Parker the Bear is feeling poorly and he needs your help to aid him back to full health. Find out everything you need to know about Parker’s booboos through the interactive app where you can listen to his heartbeat, check his temperature, examine x-rays and even play fun games and learn through activities. From the popular Jojo Siwa comes this Nickelodeon Slime Kit. This is brilliant for those who enjoy sticky, slimy, gooey fun (like any 5 years old possibly wouldn’t). Watch Jojo make slime on her Youtube channel and then recreate her recipes with this super cool DIY kit – what’re you waiting for? Get slimy. Put your mermaid’s motor-skills to the test with this Melissa & Doug Puffy Sticker Activity Book. Kids use the 65 reusable stickers to create awesome under-sea scenes in the mermaid dressing room and coral reef, and with 65 stickers, there’s lots of fun to be had as you can peel them off and start all over again. From Do It Yourself Divas is this incredible DIY Mermaid Tail. It takes just 30 minutes to make, so lack of time is no excuse for this quick make. Follow the simple YouTube video tutorial and you’ll have a swimmingly-good tail for your mini-mermaid in no time. If your little one’s birthday party going to be mermaid themed, why not surprise her with her very own splashy tail? You’ll be sure to get her fins a-flippin’ with one of these DIY tails by following this great tutorial from The Suburban Mom’s blog. By following these 3 SUPER easy steps, you’ll be able to make your little girl’s dreams come true with this DIY Mermaid Tail For Swimming – could you imagine how much her face will light up when she realizes she can actually swim with this? All her mermaid dreams will really come true.